Smith and Bybee Wetlands Natural Area (aka Smith and Bybee Lakes) in northeast Portland is a great spot in late summer as the water levels drop. Large flocks of American White Pelicans, California Gulls, Great Egrets, Great Blue Herons, and various shorebirds gather to feed in the shallow water and on the mudflats. 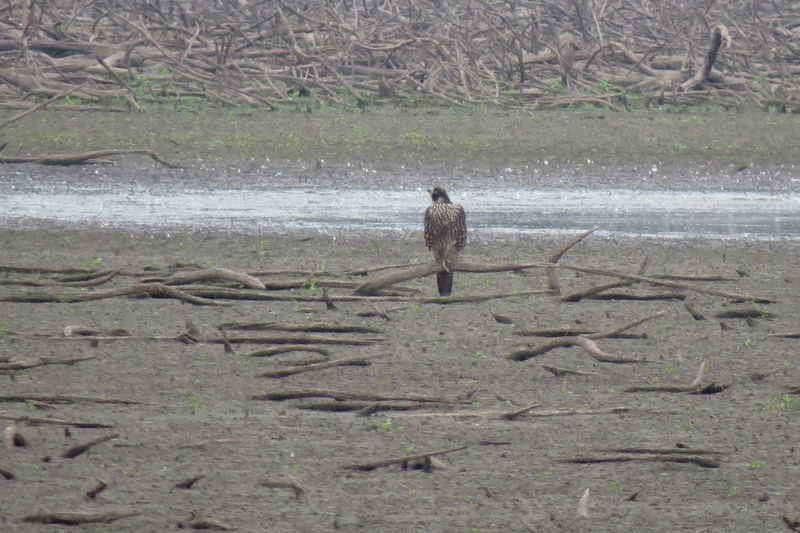 On this visit, most birds were pretty far away, but could be scanned with a scope. 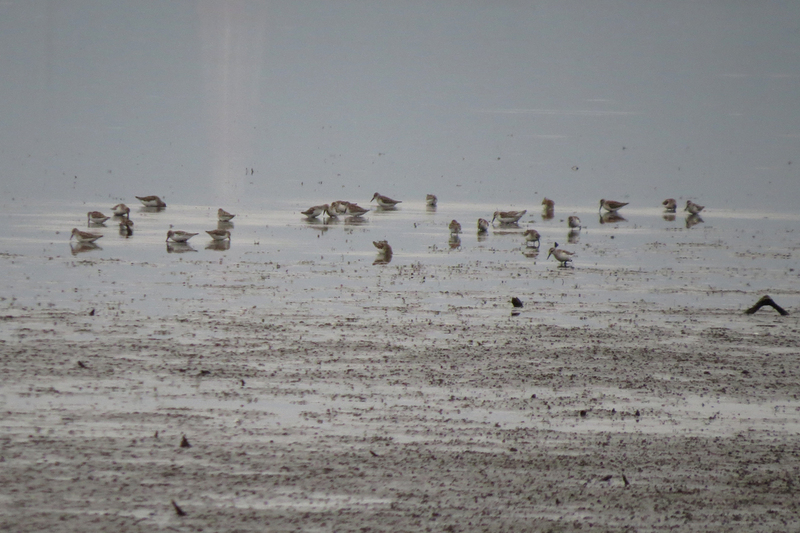 Western and Least Sandpipers were the only shorebirds I could pull out of the distant flocks, but other species have been reported recently. 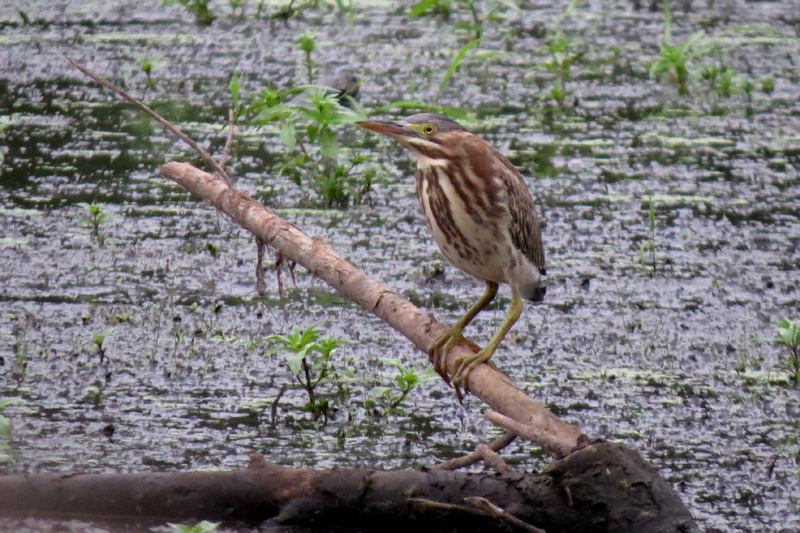 This juvenile Green Heron was hanging out at the canoe launch on Smith Lake. 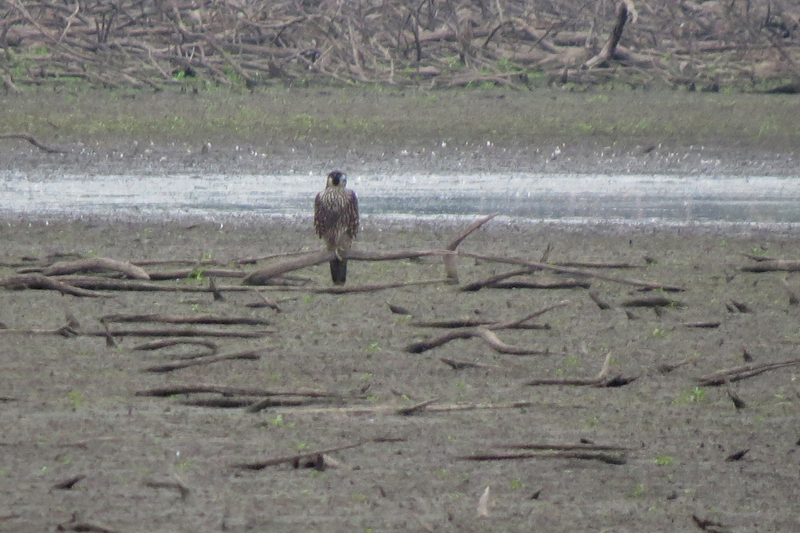 In the same area, this Peregrine Falcon was surveying the mudflats for tasty shorebirds. 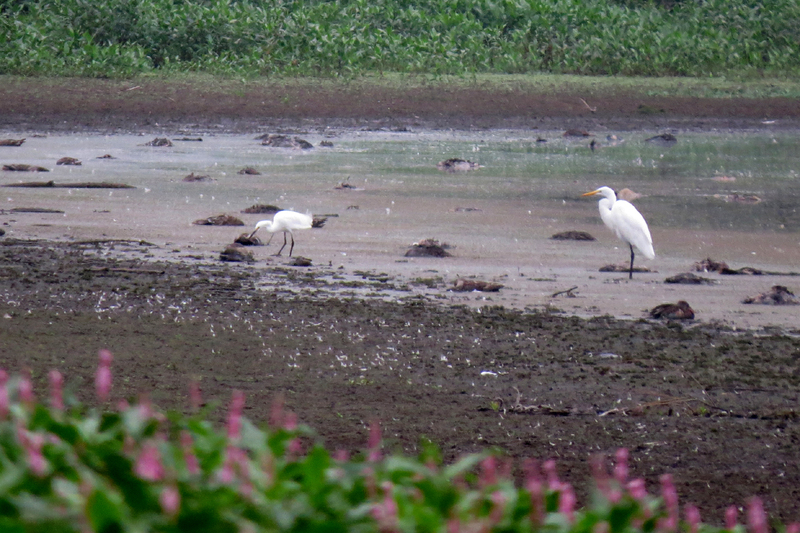 On Bybee Lake, large numbers of Blue Herons and Great Egrets were gathered. At the edge of the group was this Snowy Egret, an uncommon visitor to the Portland area. 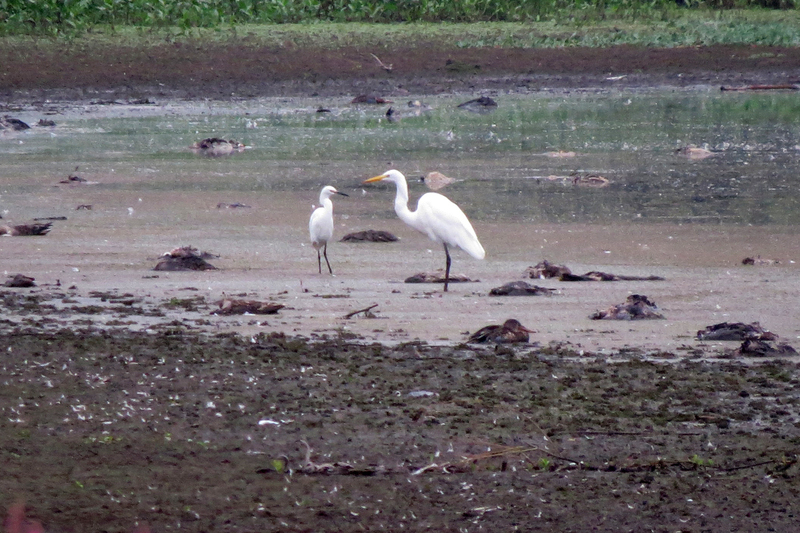 Here is a nice comparison with the larger Great Egret. The lumps on the shoreline are dead and dying waterfowl, mostly Northern Shovelers. Warm temperatures and low water levels sometimes lead to outbreaks of avian botulism. Outbreaks usually subside with cooler temperatures and rain, which we are now getting in Portland. This entry was posted in OR Birding Sites, seasonal movements and tagged Great Egret, Green Heron, Peregrine Falcon, Smith and Bybee Wetlands, Snowy Egret, Western Sandpiper. Bookmark the permalink. Very nice shot of the Snowy! This is the first photo I have seen of the bird where it isn’t a million miles away. I love your header also- is that Bayocean Spit? Where was the shot taken from? Jen, The header photo is Bayocean Spit. I took the photo from the road leading up to Cape Meares. This road is constantly trying to fall into the ocean, so it has been rerouted since this photo was taken. You can still get to the spot by walking the little “oxbow” of road formed when the new section was put in.